Other Products by Herbs Of Gold. Search other Calcium products. 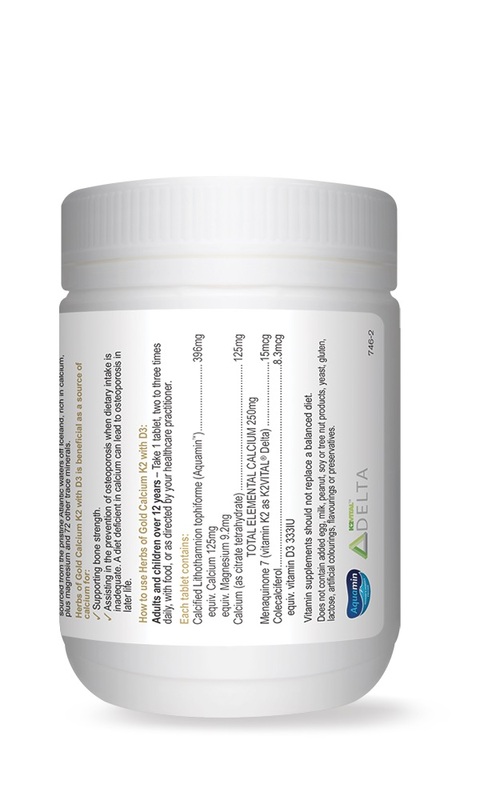 Herbs of Gold Calcium K2 WITH D3 is a unique blend of two organic highly bioavailable forms of calcium aquamin derived from highly mineralised seaweed and calcium citrate, along with Vitamins K2 and D3. Calcium is one of the most important micronutrients for the human body, used for a range of chemical reactions and to form structure within the teeth and bones, where it helps to form the hard crystals that give these tissues strength and structure. Herbs of Gold Calcium K2 WITH D3 contains 250mg elemental calcium, and vitamins K2, per tablet, along with vitamin d3 for optimal bone health, at 333iu. Calcium is important for the prevention of osteoporosis and osteopenia (a milder form of the former)1. If serum levels fall too low, bone tissue actually releases this mineral into the blood to maintain it, as it is used for muscular contraction, clotting of blood, nerve health and cellular signalling. Therefore, bone is actually an active tissue, one of its functions of which is as a reservoir or storehouse for this mineral. Vitamin D3 enhances the absorption of calcium, and phosphorus, from the intestines, enhancing bioavailability of these important minerals2. Hence its inclusion in this formulation. 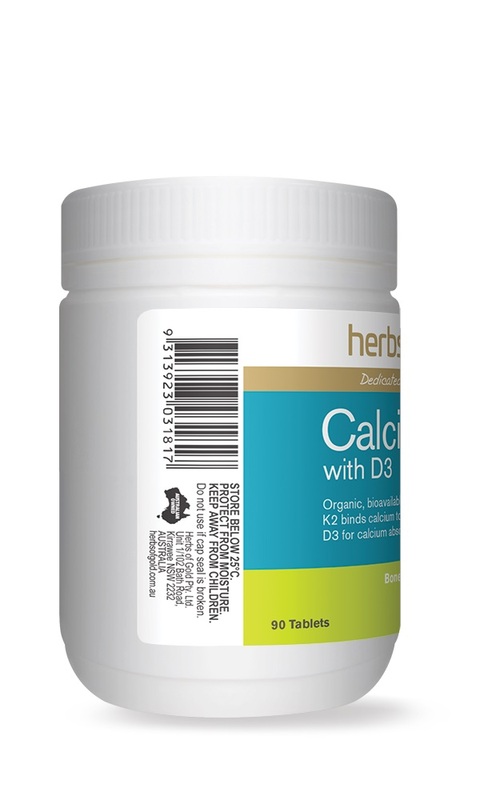 Herbs of Gold Calcium K2 WITH D3 contains 333IU Vitamin D3 per tablet. 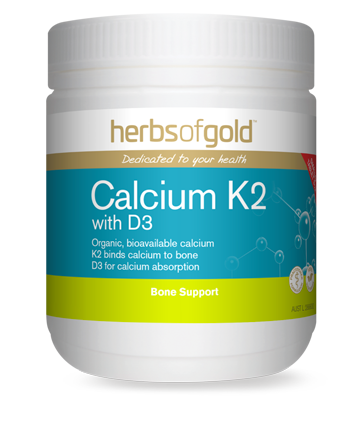 Herbs of Gold Calcium K2 WITH D3 also contains another important nutrient called Vitamin K2, which is needed for osteocalcin activity, a protein that binds calcium in bone, and is needed for optimal bone strength. 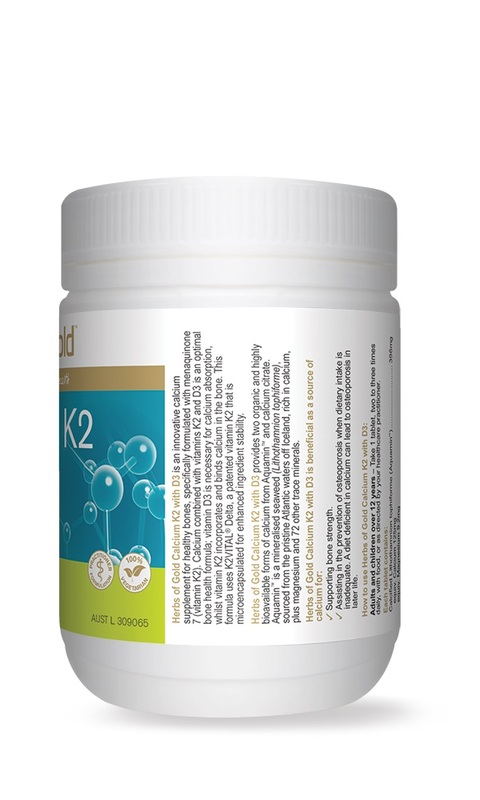 Vitamin K2 has also been identified to also assist with cardiovascular health, by reducing vascular calcification, and may help to prevent diabetes and osteoarthritis3. It can sometimes be difficult to obtain enough calcium from food sources, particularly for vegans, are those with decreased food intake in general. This is when Herbs of Gold Calcium K2 WITH D3 becomes very helpful for keeping calcium levels elevated. Herbs of Gold Calcium K2 WITH D3 is a fantastic bioavailable calcium supplement that also supplys two very important synergistic vitamins. Adults and Children over 12 years take 1 tablet, two to three times daily with food or as directed by your healthcare practitioner. Does not contain added egg, milk, peanut, soy or tree nut products, yeast, gluten, lactose, artifical colourings, flavourings or preservatives.